The CBA is your partner in law because we help you and your practice in six key ways. First, we offer networking through our sections and committees. This provides numerous opportunities to connect with attorneys from all fields of practice. Second, we help you stay current in the law with educational programming and materials from our sections and CBA-CLE, as well as with state-of-the-law articles from The Colorado Lawyer monthly publication. Third, we offer practice management assistance. As a member, you have access to free legal research through Casemaker, to the CBA’s ethics hotline, and to practice management information on everything from software to hiring. Fourth, we help improve the practice of law in Colorado by providing volunteer and leadership opportunities and by lobbying in areas affecting attorneys and law practice. Fifth, we offer mentoring opportunities, connecting new and established attorneys and creating lasting relationships. Sixth, we offer a jobs board for attorneys seeking employment. Need another reason? Click here for comprehensive list of our benefits. To become a CBA member, sign up online, email membership@cobar.org, call 303-860-1115 or stop by the CBA offices at 1900 Grant St, Ste 900, Denver, CO.
Browse our comprehensive member discount program offering you reduced rates on products and services for your business, insurance, financial, and personal needs. 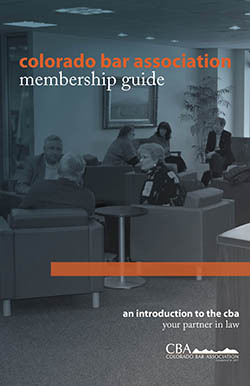 Any prospective or current member of the CBA may apply for a reduction of general CBA click here. To apply for assistance, please fill out this form and email it to Gary Abrams. Tuition assistance will be granted at the discretion of CBA-CLE and may not apply to all programs.